Collision of two vessels caused a massive oil spill in the Bohai sea leading to heavy pollution of the maritime ecological system. The following lawsuit served as a landmark for similar cases in China. The case is of paramount importance as it is the first in China in which maritime authorities used the courts to claim compensation for environmental damage at sea. 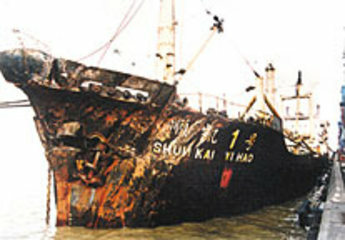 With the authorization of the State Oceanic Administration (SOA), the Tianjin Maritime Bureau brought a lawsuit in the Tianjin Maritime Court against the owners of the "Tasman Sea" (Infinity Shipping) and its insurer, the London Protection and Indemnity Club, seeking compensation for damage caused to the maritime environment. It is the first marine ecological claim in China, following its accession to the 1992 International Convention on Civil Liability for Oil Pollution Damage . On December 30, 2004, after two years of investigation, the Tianjin Maritime Court ordered the two defendants to pay out a total compensation of 42.9 million yuan (US$6.7 million) to the plaintiffs. Over 17 million yuan (US$2.6 million) were ordered to be paid out to the group of 1,490 fishermen plaintiffs, that had been impacted by the spill. Over 15 million yuan (US$2.3 million) were assigned to Tianjin Fisheries and Harbours Office for losses to fishery resources. Almost 10 million yuan (US$1.5 million) in compensation were intended for the Tianjin Maritime Bureau. Of which 7.5 million yuan were meant to compensate for the loss of environmental capacity and 2.5 million yuan making up for the costs of investigation. Following the verdict, the defendants immediately appealed to the Tianjin Higher People's Court. As a result, seven years later, the defendants only paid out about 21.2 million yuan (US$3.3 million), less than half of the original amount of compensation . Despite the fact that the case against the Tasman Sea and its insurer was not a victory in financial terms, the lawsuit was a landmark for upcoming cases. It raised awareness between officials in Chinese maritime authorities for their possibilities in claiming compensation through the courts. Additionally it set a precedent for safeguarding the rights and interests of China's marine ecological environment, which has had a profound impact on the maintenance of China's marine ecological rights. The case served also as a precedent for finding within the scope of damages owed by a responsible party: losses to maritime ecological functions, cost of restoration of maritime sediment, cost of restoration of tidal shoals and other environmental costs . The case of the Tasman Sea prompted the State Oceanic Administration in 2007 to publish the "Guidelines for Evaluation of Environmental Losses Due to Maritime Oil Spills" . Project Details The Maltese-registered "Tasman Sea" was loaded with 81,398 tons of crude oil for China International United Petroleum & Chemicals Co., Ltd. (UNIPEC). Around 160 tons of crude oil were leaking into the waters. The area affected by the oil spill was 359.6 km². Why? Explain briefly. The financial compensation for the affected fishermen cannot be counted as a success, since the final sum of money was only half of the claimed prospect. Yet the case served as a pathfinder for following cases of oil spills and environmental pollution in China. It also prompted further research in the field, prompting the publishing of the "Guidelines for Evaluation of Environmental Losses Due to Maritime Oil Spills".